The Year 9 Advance group from Manangatang P-12 College made us an amazing vehicle dashboard for pretend play. They have been working on it for a while. It has foot pedals, steering wheel, windscreen, mirror and gear stick for us to play with. 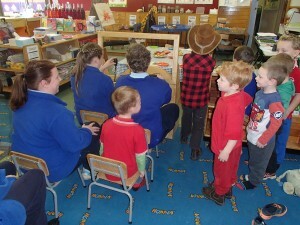 The children quickly set up chairs behind and waited for their turn. Thank you to Mr Richies and his team. This was an amazing gift and will be treasured for gererations to come. 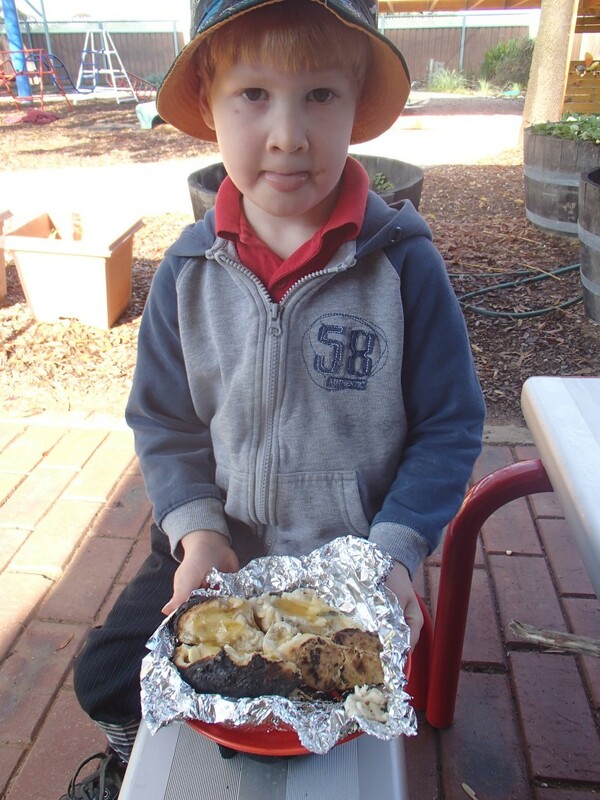 This is just another example of how the community support our pre school. The Advance Group are also working on other projects for us. 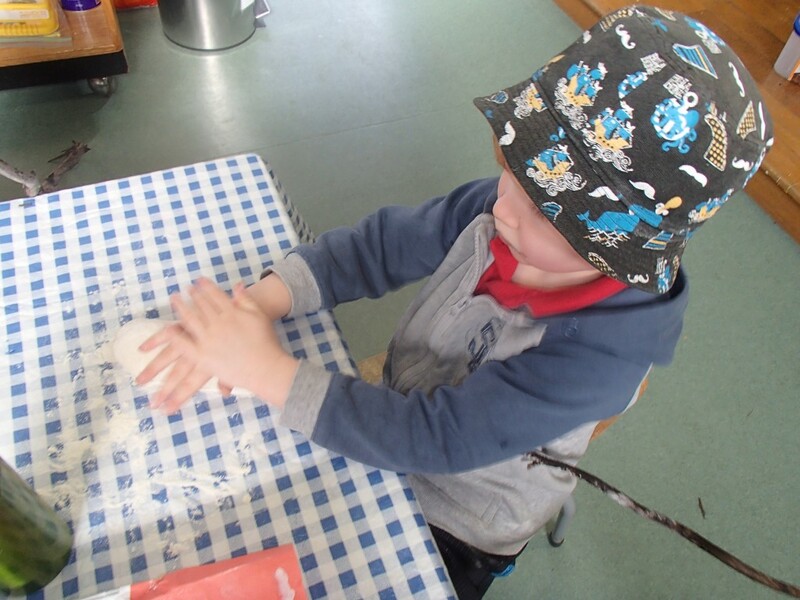 We have been exploring shapes a lot during our dough making this term. Today while we were rolling out dough to make our ‘Queen of Hearts tarts’ one of the children said, “I have made the shape of Australia.” And he had! We have followed that up this week with a look at some shapes of other continents of the world. 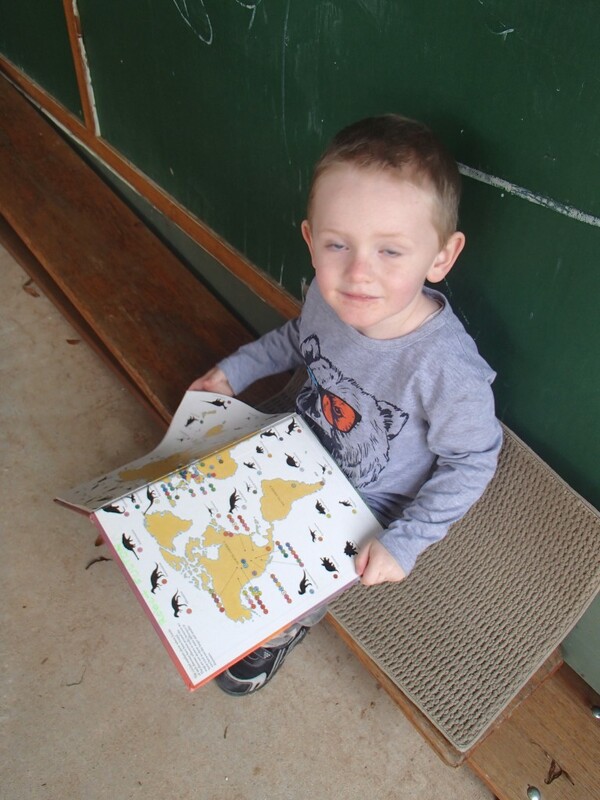 We looked at Africa and North and South America. We know a lot about the animals of Africa but very little about the other continents. 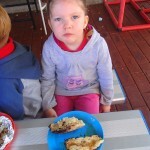 We also talked about Australia being the largest island and the smallest continent. 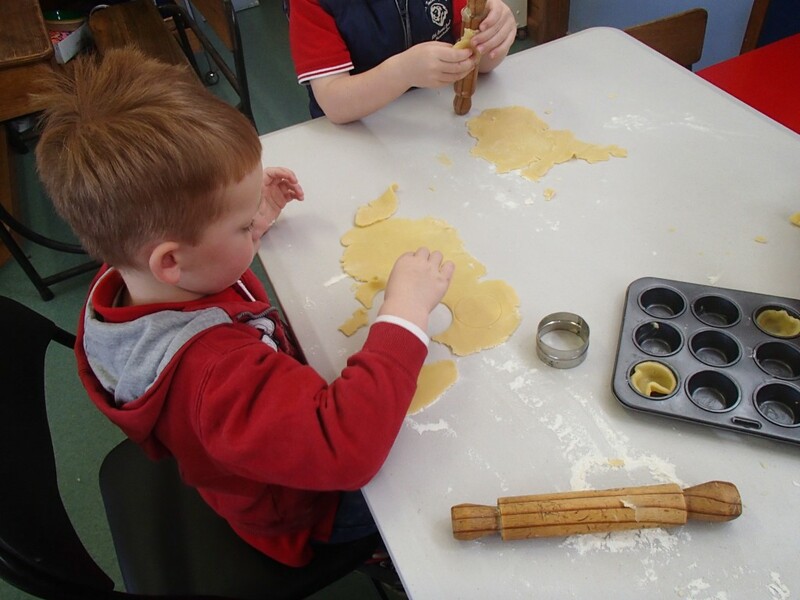 Of course we used simple round shapes to make our tarts – and they were delicious! While the children loved loom bands for a week, we quickly found a new use for all the bands we had at Pre School. 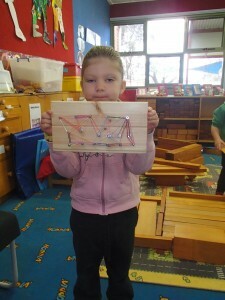 Lilly used them to put on the nail board she had made and then we all wanted one too! 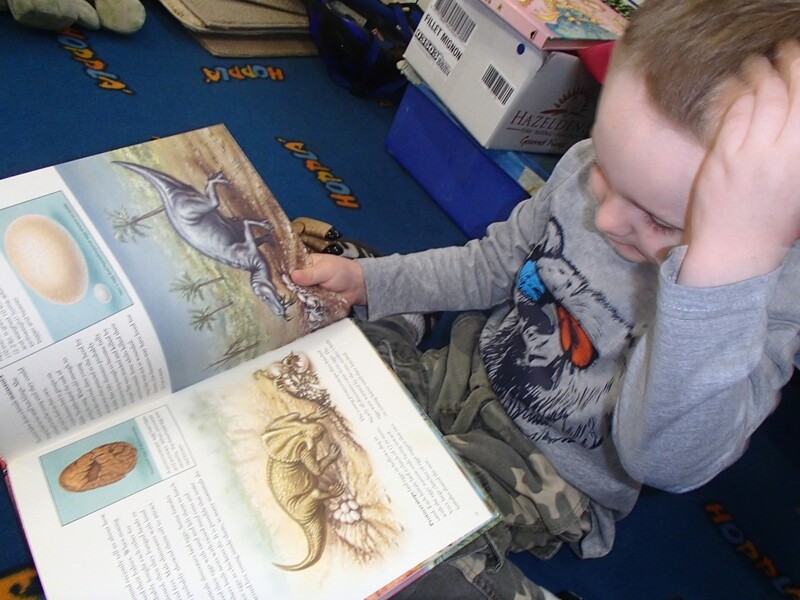 Jake brought along a book about dinosaurs this week and when Tao came on Thursday he brought along a toy dinosaur. He was fascinated with Jake’s book. 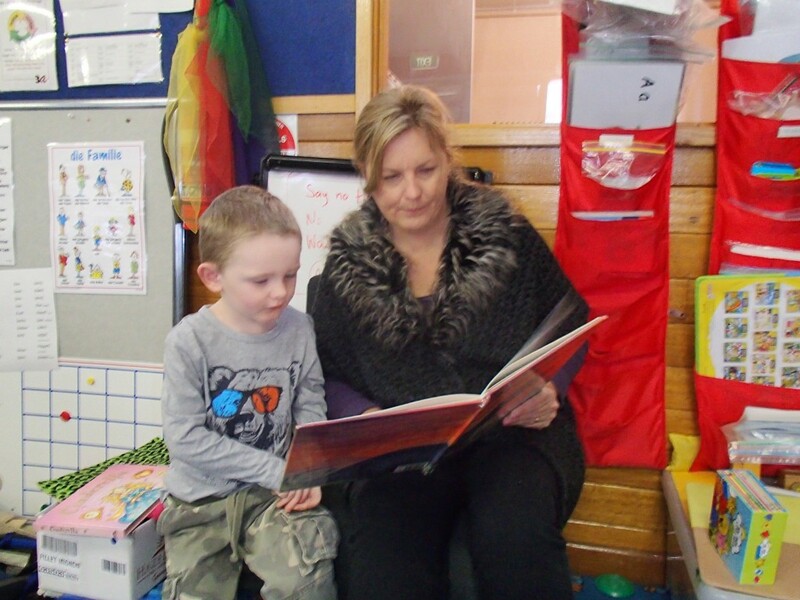 I took some time to read to him from the book. Then he read the book himself. 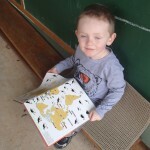 He went back inside during outside time and brought the book outside to keep reading. We will get some dinosaurs to put in the sand pit for next Thursday when Tao comes back again! 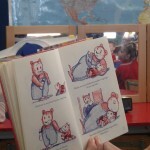 Today Monika read us the story of ‘Bei Bobo zu Haus’ Bobo is a bear. 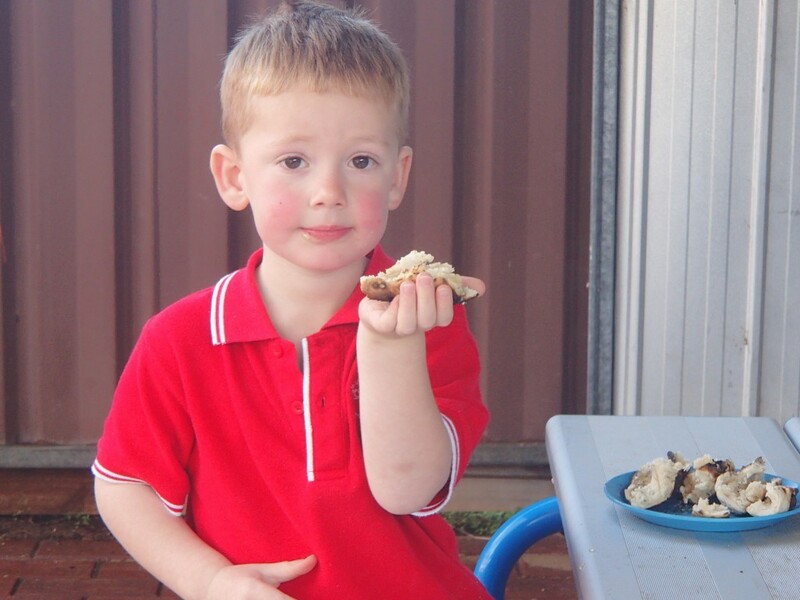 The story went through a family’s morning routine of Bobo being woken up, having breakfast and playing with his toys and his Papa. 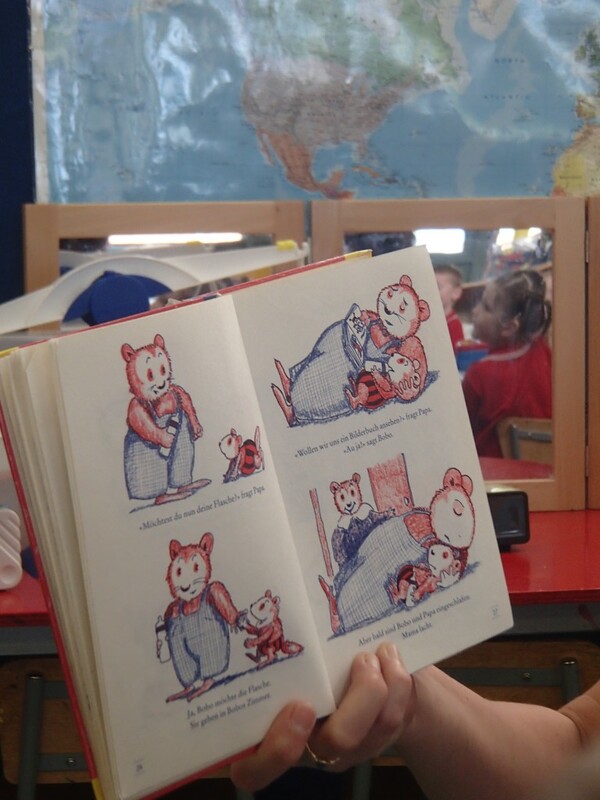 The illustrations were clear and the children were able to predict the story as Monika was reading in German. 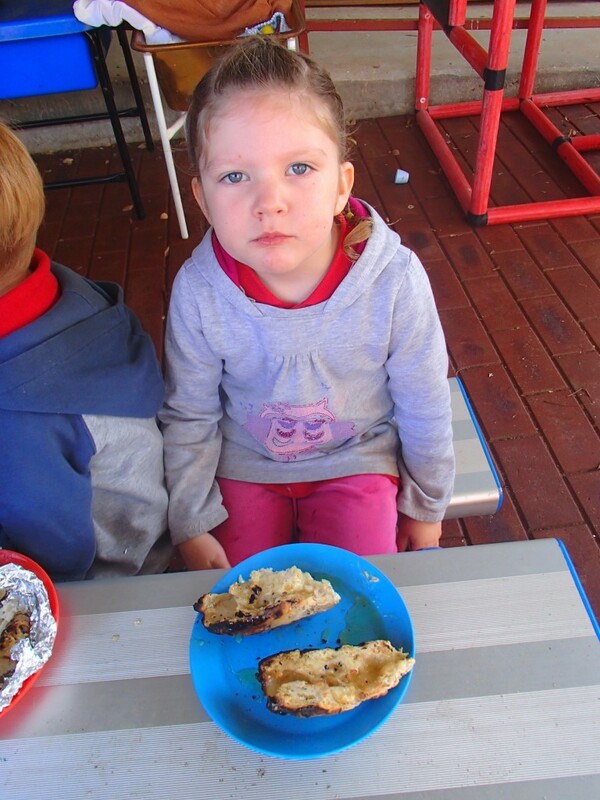 This is an improtant skill that they will be able to transfer into reading when they get to school. 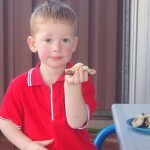 This weeks dough challenge was probably more about tradition that making dough, as we made damper. 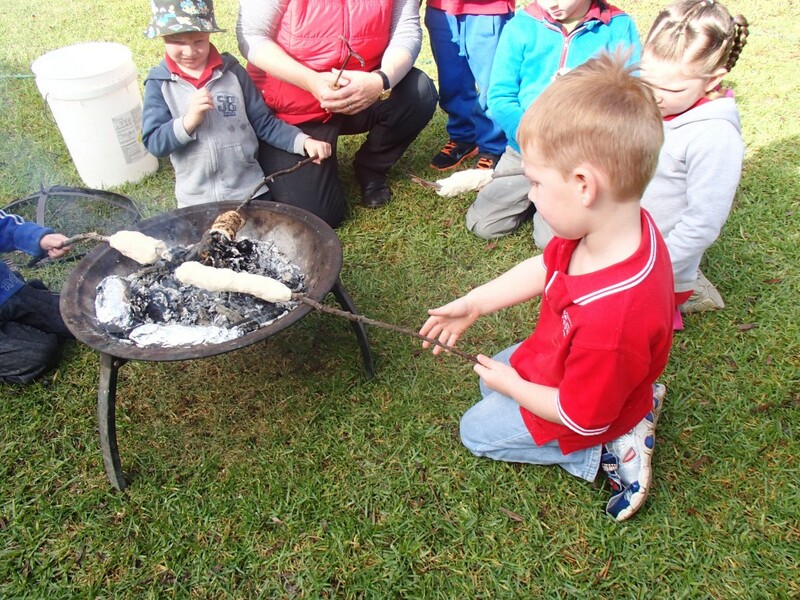 Damper is a traditional scone dough cooked on a stick over the fire. It was popular with new settlers and stockmen. 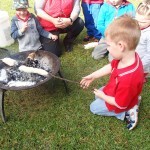 It is still popular around campfires today. 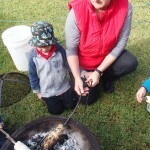 We lit the fire early in the morning and allowed it to reduce to hot coals. We went for a walk to find suitable sticks. 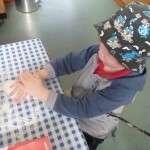 We made the dough into a thick snake shape and wound it round our sticks. 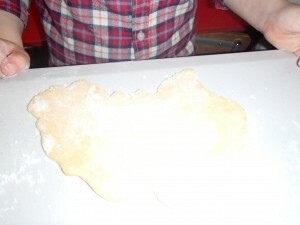 Then we squeezed it a little to make sure it stayed on. 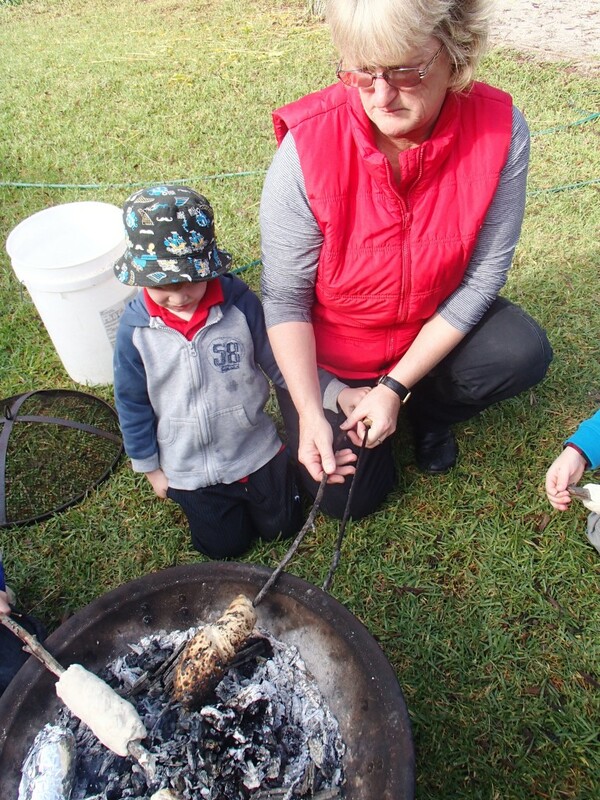 Then we cooked it on the fire – making sure to turn it every so often. 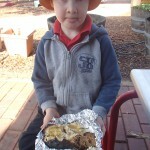 Damper is tricky because it looks cooked on the outside and is often still raw in the middle. Then we added butter, jam and honey and enjoyed all our hard work.